My syndicate News America Syndicate was in the process of being absorbed by King Features. These things are never easy, but this transition (there it is again) was a bit more traumatic for a couple of reasons. To begin with, Richard Newcombe, the president of News America, had begun the process of instilling a different culture at the syndicate. For example, in 1985 we had begun receiving subscribing client lists along with our customary royalty statements. From that point on, I would finally know each and every paper that Funky Winkerbean and John Darling were in. Looking back from today’s perspective, it seems a little hard to believe that getting that information wasn’t just pro forma policy, but trust me when I say that it was a big deal back then. My contract, of course, stipulated that I could request such a list at any time, but they weren’t provided as a matter of course. In our fearful and obsequious state of mind, we cartoonists were too timid to ask. That being said, I did request that list once, and, when it arrived, the papers were there, but all of the rates were redacted. It’s a rather cringe-worthy admission, but aside from Funky’s initial launch and my lone request, I never received another list of my client papers. I didn’t know who they were or what they were being charged. Until Rick sent them to me. In a letter to the contributors in 1985, Rick once wrote: “Simply stated, this is a part of the open door policy that will be in effect at News America Syndicate so long as I am President and Chief Executive Officer. 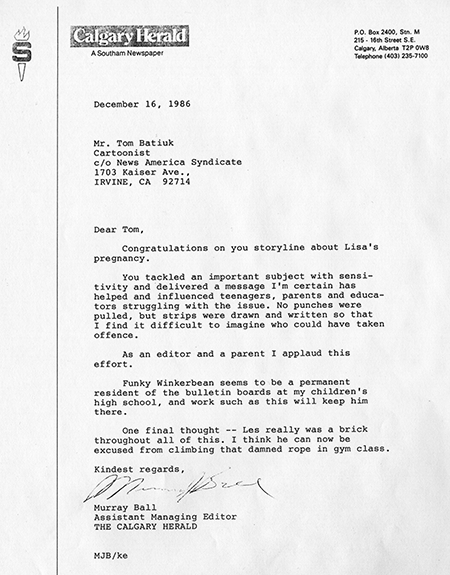 It is my sincere belief that all of the Syndicate’s contributors are entitled to know as much as we know about their strengths and weaknesses in the marketplace we serve.” He had me at “simply stated.” Rick Newcombe, of course, had been the one to give me complete editorial control of my work, but Rick also helped instill in me that most ineffable of notions, the idea that the characters I had created for Funky Winkerbean and John Darling belonged to me. I should be the owner of what I create. That just wasn’t the norm at that time, but Rick thought that it should be. And I was beginning to think so too. I had previously gotten in touch with my attorney and, at my behest, he had sent News America a letter saying that I wanted to renegotiate my contract and, failing that, I would take legal action to have the contract overturned. So you can see that the idea of no longer being able to work with Rick once the syndicate had changed hands was indeed traumatic. In February 1987, Funky Winkerbean and John Darling moved from California to New York, the home of King Features, and along with them traveled the letter from my attorney. Beginning with 1987, Ed Crankshaft, the curmudgeonly school bus driver in Funky Winkerbean, stopped appearing in the strip. On February 13, 1987, Richard Newcombe founded Creators Syndicate. That being said, after going through the three years of strips in the volume, it seems those sentiments may have been something of an overreach and it appears I have to walk things back a bit. True, I did deal with the topics of dyslexia and steroid abuse, and my adult and student relationships with others were starting to leave the surface jokes on the surface and beginning to dig down to the strata where a more natural and interior behavioral humor resided. These weren’t huge reaches, but significant nonetheless. However, along with that we still have things like a talking scapegoat, talking leaves and watermelons, a Star Trek convention being held by a school computer that accidentally invites Dr. Spock instead of Science Officer Spock (actually, that’s kind of cute), along with me not only breaking the fourth wall but doing a complete demo of it on some days (I’m thinking here of the Halloween watermelon arc where I’m being investigated to see if I actually use watermelons for jack-o’-lanterns and the daily strip where I’m hiding in my studio as Mike Wallace from Sixty Minutes knocks on my door), and, yes—even Les still getting stuck on the cursed rope in gym class. The strip seemed to be running on two tracks and was kind of schizophrenic at this point. 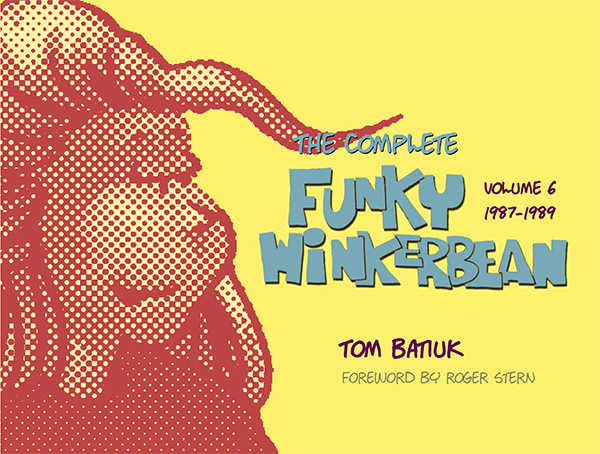 So it raises the question that you were about to, you clever devil—is there a real Tom Batiuk in these pages somewhere? Yes, there absolutely is. To para-song-check Pete Townshend, my dreams weren’t as empty as my conscience seemed to be. What we’re seeing in these pages is an artist in transition, and it’s called a transition for a reason, people. It’s, to quote my Aunt Merriam, “the process or a period of changing from one state or condition to another.” What my dear auntie is saying is that these things don’t happen overnight. You necessarily have to travel through a period of flux to get there. One foot planted where you were, and one planted where you want to go. Thus what we have here is Funky the flux years, but it wasn’t only the strips that were in flux. Back then as far as my work and career were concerned, everything was in a state of flux.